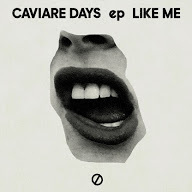 Caviare Days are an alternative psychedelic rock group from Sweden, have a new release - Like Me EP. Originally formed in Brooklyn, America by sisters Lina and Maja Westin, that have not only relocated to their native Sweden but are currently a five piece band with Timmy Grim - drums, Boris Grubesic - guitar, and Marcus Arborelius - keyboards and synthesizer bass. The songs are very '60's alternative psychedelic rock and ironically they're all British influence have had the Abbey Road Studios treatment to get a raw echoey edge to the sound. From the opening track Like Me, Great Minds - has some nice double vocals to get that stereo sound through the speakers, the epic revenge song Trigger, and the grungy Green, each have a good solid rhythm with parts of experimentation supplied by the guitars, and synthesizers to cut their unique sound above the rest. Caviare Days are a group worth checking-out as they'll sure produce some more musical surprises along their creative path.